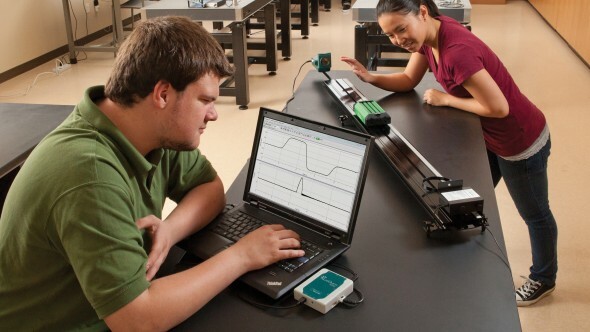 Experimentally, in our physics laboratory we can use any of several methods to measure the velocity of objects. 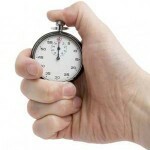 The simplest way to measure velocity is to use a stop watch and a meter stick. Unless one is careless, human error can seldom be attributed to errors in experiments. However a stop watch is only as good as the human controlling it. At best, human reaction time is a fraction of a second (1/5th) and this alone can create an error. We can eliminate the human error factor by using a photogate. In a photogate, when our moving object blocks a beam of light it triggers the start of our timer. When it blocks a second gate in can stop the timer. Some photogates are standalone devices, others will integrate with a computer. You can also set photogates to measure the shorter time that the beam is blocked as an object of a given physical size blocks the beam. A tickertape machine emits a very creepy sound. It has a small metal stylus which bumps up and down at 60 cycles/second. This frequency is because of the frequency of Alternating Current electricity which powers the apparatus. A long piece a ticker tape is attached to the moving object and pulled through the machine as the objects moves. A piece of carbon paper is placed between the vibrating stylus and the ticker tape. Each time the stylus bounces down, it leaves a carbon dot on the paper. 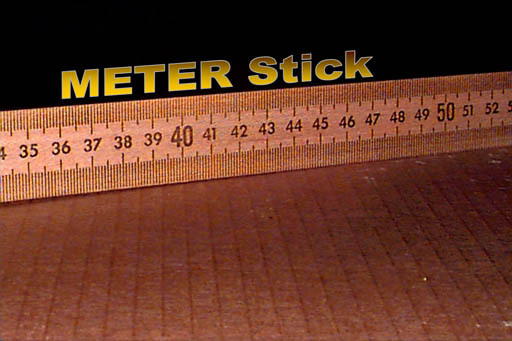 The distance between these dots can be measured with a simple meter stick after the experiment is performed. 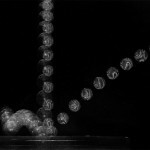 The time between dots is simply 1/60th of a second. It is insightful to note that the faster an object moves, the greater the spacing between the dots. 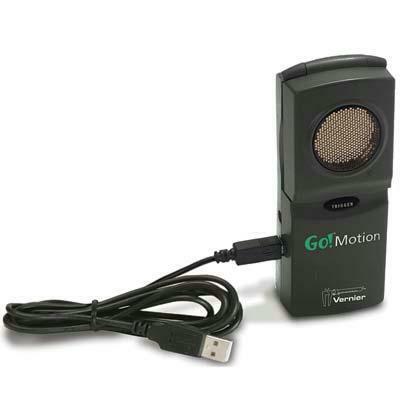 Ultrasonic Motion Sensors are similar to the radar guns used my police officers to measure the speed of cars on the highway. The major difference is that these sensors use ultrasonic waves. These are sound waves with a pitch so high that they are beyond the range of human hearing. 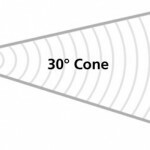 The sensor emits the ultrasonic waves in a focused cone. As the waves bounce back to the sensor, the sound wave is collected. 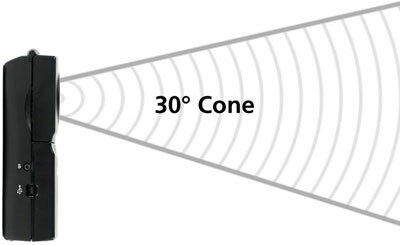 Because of the Doppler shift, we can accurately measure the velocity of the object. 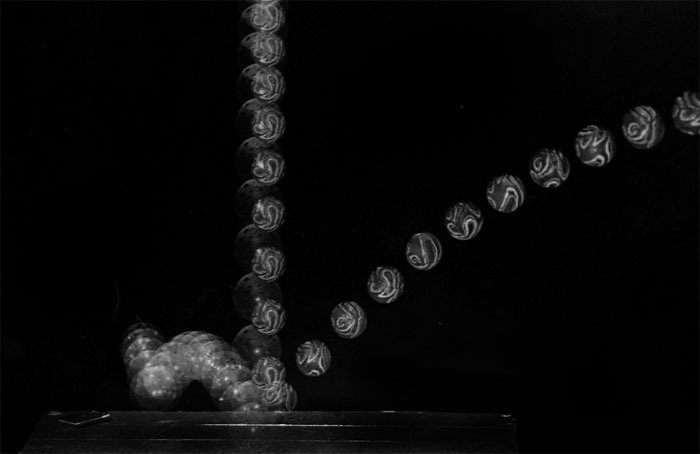 Video Image Analysis: Years ago, we could take photographs using a strobe light to make kinematic measurements. If you look at stroboscope photos, you can clearly see how the spacing between images increases with speed. 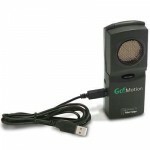 Today, we can gather video footage with a webcam or your cell phone. Since the video is gathered at 30 frames/second we know the interval of time in the photo. If we know the relationship between pixel size and distance, we can easily find velocity. This can be accomplished if we know the size of an object in the video. 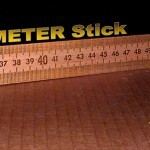 Or a meter stick can be placed in the video as a reference scale. However, one must be cautious for the effects of parallax on the video image. If an object is farther away (or off angle) then it will appear to be smaller. A discreet method would be to use LoggerPro or VideoPhysics by Vernier Software. In this software you click on the position of the object you are trying to analyze during each frame.